Nourison Hand-tufted Contours Botanical Mocha Area Rug - 5' x 7'6"
Nourison Contour Hand-Tufted Botanical Mocha Rug - 3'6" x 5'6"
Nourison Hand-tufted Contours Botanical Mocha Rug - 7'3" x 9'3"
Hand-tufted from plush polyester, this soft area rug from Nourison features cool colors to complement contemporary decor. The brown backdrop is patterned with a blue botanical pattern for a nature-inspired look. Dress this piece up with metallic accents for a hint of modern shine. Tip: We recommend the use of a non-skid pad to keep the rug in place on smooth surfaces.All rug sizes are approximate. Due to the difference of monitor colors, some rug colors may vary slightly. We try to represent all rug colors accurately. Please refer to the text above for a description of the colors shown in the photo. 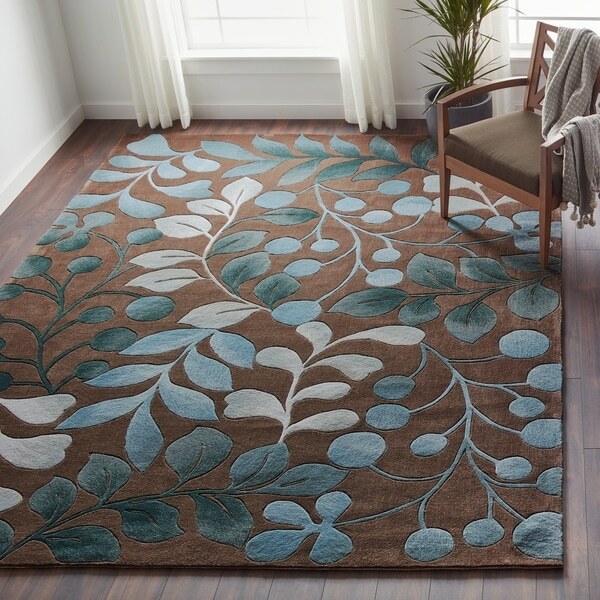 This Botanical Mocha area rug is ABSOLUTLY BEAUTIFUL!! Refinished floors in a pickled oak color. Bought an 8'X10'6 and a 5X7'6 for our 25'X 13' living room. Painted wall whispering wood a grayed cocoa brown with one wall light grayed tan. Colors are a true chocolate brown background color leaves are pale sky blue with silver tone, a medium muted turquoise ( not as bright as pictured) and a deeper gray blue. It is a nice thick carpet. I bought (due to reviews) the more expensive Durable hard surface and carpet pad. That gives the carpet a cushy nice feel. I only used the Ultra non slip pad in the dining room as that is easier for chairs to slide. But these carpets are nicer than anything that I saw in the stores over two years of looking. Buy it while they still have these, they are just excellent. This is a beautiful, plush rug. The colors shown in the ad are an accurate representation of what the rug looks like. It adds warmth and color to the room. I love it, and recommend it to others. The rug is heavy with luxurious pile and beautiful rich colours that are true to the online pictures. I usually like to know if the rug is woven from continuous filament nylon. Unfortunately, in the process of rushing the finishing touches for our new home before our daughter's wedding, I ordered it without an answer. Since the fiber is made from short pieces of yarn cuts, all you have to do is walk across the rug and there are large, chunky pills of yarn. Under the table after a dinner party, it looks like it's never been vacuumed. Hopefully, in 6 months to a year, this problem will stop. I purchased this rug for our living room wood floors to keep us warm during the winter. The rug arrived within 2 days of placing my order. As other reviewers have suggested, this rug is very plush and looks expensive. The colors are more muted than what appears on the computer screen but I actually like the muted colors better than the bright color shown in the pictures. The rug fits our decor which is mostly chocolate and blue. Overall I am very pleased with this purchase. I ordered two of these hand-tufted rugs - one for my dining room and one for my living room. The colors are just a viewed on the computer screen. The brown is a rich mocha and the blues vary is color from sky blue to deep turquoise. The thickness of the pile is higher than expected and feels soft and subtle when walked on. I order the thicker pad for the living and the thinner pad for the dining room where the chairs need to move in and out from under the table. I was very pleased with the quality of this rug. The colors and pattern were really pretty. Absolutely Stunning I fell in Love with this rug when I first discovered it on here and had to have it. What a Surprise when it arrived it's simply gorgeous well made very soft when walking with bare feet thick and the colors are just amazing just as pictured.Quality rug exceptional price I built my Living room around this rug. Everyone that has seen it falls in Love . I sent picture to my cousin she also fell in Love with it. I purchased one as a Gift for her she too revamped her living room around it and now wants the runner . 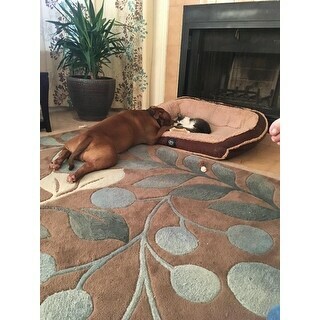 It holds up still after 2 years under heavy foot traffic including my pets they Love it too. Good Job and would definitely buy from this company again. 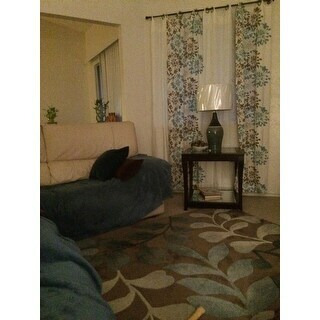 This is a great area rug I bought 2 different sizes and just love them. Yes I would recommend this product to anyone that loves a great beautiful rug for their dining room and living room. I am so happy I bought this rug! The pictures don't do it justice. The colors are lovely, very true to the picture. The brown is a mocha color, not a chocolate brown, which is what I wanted. There are many shades of blue which allows you to match it with so many colors. It's nice and soft, a nice plush pile, with little to no shedding. It was packaged very well and delivered a few days after I ordered it. Love it! UPDATE: WOULD NOT PURCHASE IF I HAD THE CHANCE TO AGAIN. I initially loved this rug. It is very soft and comfy to walk on, and does match my room great but it sheds like crazy. 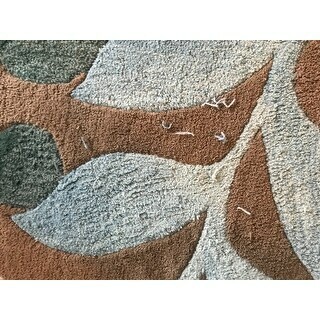 Threads of carpet fibers fall out CONSTANTLY and after only a couple weeks it looks like it’s 5 years old. I can pull at the loose thread and it comes right out. This absolutely does not hold up well. I see now why it was so cheap. Not happy at all. I am so in love with this rug!! It was more than we usually spend, but well worth it so far. It’s so soft and you can definitely feel the quality! And it got here in like 2 days. So excited!! It did have a funky kind of fishy smelly at first but I vacuumed it to remove any excess fibers and after airing out overnight it’s totlaly fine. Neighbor had one... we were copy cats ! Very Please, it was beautiful, bought a second one. This rug has held up great. I love the colors and have not yet got any fuzz balls off of it . Well made and love it. Ordered this rug and it arrived promptly, looked great, smelled terrible. It seemed to be the backing. Almost a fishy smell. Aired it for 3 days on a screened porch and it still reeked. Shipped it back and get a replacement. I was told they would check at the warehouse to be sure it smelled ok, but the new one smells just as bad. Now have the inconvenience of returning a second large rug. Will not order a Nourison again. I got this carpet in a couple days from Overstock and I was ecstatic at the quality and colors. I have received so many compliments on the carpet. It is so thick and so comfortable to walk on. It matched in my dining room perfectly. The only problem is I find my dog lying on it every morning under the dining room table...but it just goes to show how comfortable it is. The colrs are so bright and vibrant. My rug is actually 8 x 10'6". It seems to be a nice quality and soft to walk on. The color is not as vivid as shown in the pictures, but it's still a lovely rug. Now that my livingroom is all done the first thing everyone says it that's a lovely rug. They all love it and I do too. I bought the pillows to match and they finish the look. 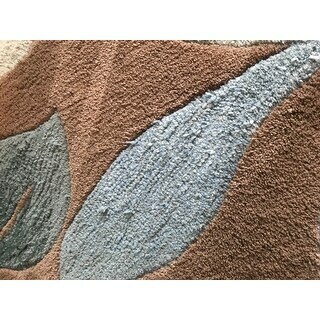 This rug is thick and has rich colors - looks just like the photo. I'm very happy with this rug - it looks great in the room! This rug is beautiful. The quality is nice, and it doesn't shed. The colors are just like the picture. Great quality for the price. This is used in our dining area under a table so it does not get a lot of foot traffic so not sure how it would hold up under those circumstances. Colors are true to the picture. Would purchase again. Absolutely love this area rug. It is very plush and great for our children to play on or for us to sit on with them. We have had it in a fairly heavy use area for awhile now and it has held up beautifully. Highly recommend!! Very happy with this purchase. The colors are exactly as pictured. It rolled out nicely and all of the edges flattened out within a day or two. This was bought for a bedroom and is the perfect thickness and feels great under the feet. It looks exactly like the picture but what you can’t see is how thick the pile is. I was really very pleasantly surprised. It is a beautiful rug. "From the customer reviews, present to past, it appears that the older reviews were very positive and the newer reviews were not. Is that because the newer rugs were not made as well? Perhaps a recent manufacturing problem? " "I have a tile floor. Do I need a mat under it?" I have a vinyl floor, and have not needed a mat...I would suggest to unroll carpet ASAP...as I waited to remodeling was done....However, I jusy put heay items at the end of the carpet. I LOVE ths carpet, that I just ordered the runner to match, for my hall way. "I purchase this rug. There is a strong order I assume coming from the dyes is this harmful and will it go away?" We recommend airing it out by opening the windows in the room the rug is placed in or set it outside for a couple of hours if weather permits. "Does this rug pill or shed a lot?" No indeed. We have 2 of this size and 2 one size down. One is in our foyer. We've put pads under all of them. Ownedthem about 7 months and no pilling or shedding at all. We've had so many compliments on them from friends and family. Colors are beautiful. Grayish Mocha background with shades of aqua and some blue. Works beautifully with gray sofa, side chair with cream background and similar pattern with mocha and aqua and then mocha recliner that my husband is attached to. I've always hated hois recliner color until we ties it all together with these rugs. I hope this helps you decide. Only slightly when it when we first got it. Now that it has been vacuumed a few times it does not shed. "Some reviewers described the the blue colors more teal like, is that true? I really need more of a teal/ or aqua/robin egg blue. but love the look of this rug!" "Will this rug stay put on top on carpet? 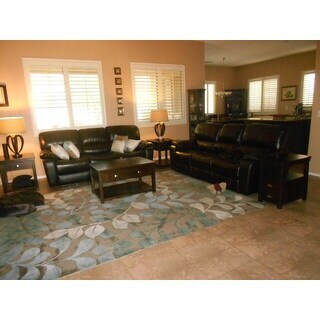 We just redid our living and got new carpet but we are looking for a large rug!" "Is the very lightest part of the rug white or tan?" The very lghtest part of the rug is actually a pale blue with a little bit of tan. There is no white on the rug. I would call it a light gray. It is a cooler color than tan and picks up the blues. From a distance you might see it as an extremely light taupe. I love this rug but do realize the brown background shows any specks of lint so I lightly vacuum it daily. More of a gray/tan color. My wife says a really light beige. Or maybe a light gray. Either way, it looks good, as good as the pictures. I'm one of those people that is bothered by minor problems or differences. This is not a time where I am bothered. It's a nice rug.